Raglan Naturally (“us”, “we”, or “our”) operates the http://www.raglannaturally.co.nz website (the “Service”). How the data will be collated and stored and who will analyse it: The Raglan Naturally coordinator and team will collate and analyse the data. Waikato District Council may assist in data extraction and entry to a report which will then be analysed by the Raglan Naturally coordinator and team. The information (paper and digital) will be held by Raglan Naturally in a secure location. How the data will be used and reported on: All data will be anonymous and raw data will not be shared with another organisation. The report, our community plan, will be publicly available. The data will be used to add to the work of the Focus Groups and create our community plan. A draft plan will be made available by the end of 2018. We will advertise this in the Raglan Chronicle and through social media. The draft plan will be open to changes and we aim to finalise it by March 2019, ready for action and implementation. 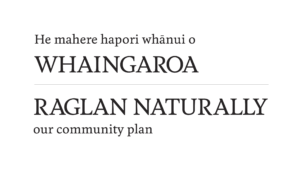 The draft plan will be communicated to the Waikato District Council for inclusion in their Raglan Blueprint Plan.